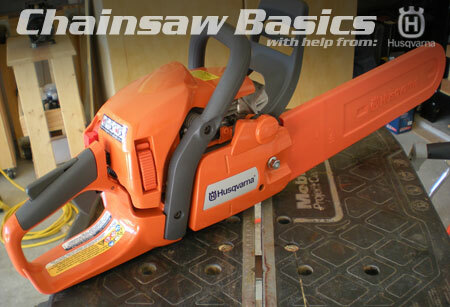 In this first Chainsaw Basics post, before we get our hands on an actual saw it’s a good time to better understand what’s actually going on when the noise lets loose and the chips start flying. We’ll begin by staring down the worst-case scenario and the 800-lb. gorilla in the room — kickback. Primal fear: It hangs in the very air surrounding a chainsaw. Don’t believe me? Tell someone you’re going to take up a leisure activity involving a chainsaw and see what kind of reactions you get. Try handing one to an unsuspecting visitor to the shop. The snap reaction you’ll witness is a base human response to an object that is violently loud, powerful and potentially deadly. However, base reactions are just that — base. A more correct word is uneducated. So let’s fix that. Kickback is really just a quick study in elementary physics. When an object in motion is stopped and the force behind that object is still supplying energy, there is an equal reaction in the opposite direction that uses your grip on the saw and the point of obstruction to determine the direction. Simply put, kickback is a transfer of momentum. There are two types of kickback, each with its own issues. Pinching the bar happens when the chain is pinched between the wood by the weight on either side of the bar during the cut. 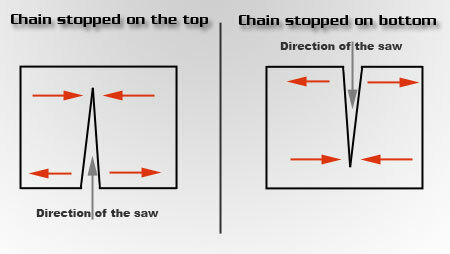 If you stop the chain on top of the bar while cutting from below, the saw kicks out; if it happens on the bottom of the chain while cutting down, the saw will slam forward. The amount of force, how fast the chain stops, and where it’s being stopped all determine how severe and what direction the kickback will be. If the chain is stopped suddenly the kickback is epic. Slow it down a touch and it’s just a little hiccup. The good news is, our goal is not to drop redwoods but to doing a bit of carving. This changes that physics equation we were talking about earlier. A carving bar or dime-tip bar has a much smaller kickback zone on the tip. The smaller zone means less chance of it getting caught. The 435 is a 2 hp saw, not 8 hp like the big dogs. This means less force is pushing back on you. Though it’s still enough to mess you up. Cutting branches or trees that are under strain or load is what normally causes bar pinching. The piece you will be carving will be smaller and mounted properly with as little inherent stored energy as possible. Less stored energy means less possibility for movement and pinching. You can still mangle yourself carving, but you can begin to see how lessening the potential problem areas starts to focus these hazards to a more manageable size. However, these are not the biggest factors that keep you safe. One of the biggest things you can do to help minimize kickback is to keep your damn hands on the saw. Maintain a solid grip on the rear and front handles at all times. You can’t slow down or redirect a wild swing of motion if you aren’t in control of the tool in the first place. Another thing you can do to minimize kickback is to plan your cuts. Don’t just hack away at a log or stump. Plan the cut in your mind and take a second to practice the motion you want to accomplish. Are your feet and hands set correctly? Can you reach the entire arc of the cut without repositioning? Are you standing to the side of the cutting plane? Are you trying to do a cut above your shoulder? These little checks will help you gauge whether what you plan to do is intelligent or not. 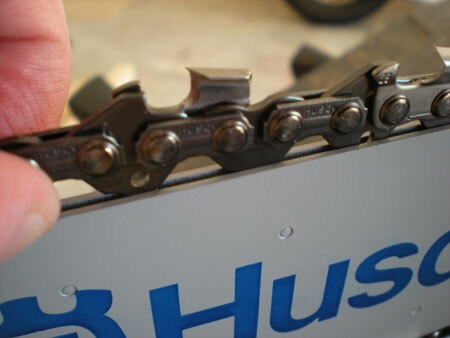 It seems like a no-brainer, but keep your chain sharp and tensioned properly. A dull or loose chain will grab wood under the best of circumstances and create all kinds of fun stories to tell your friends. You might even get a cool nickname like “stumpy” or “blood-n-guts” out of the deal, so yeah, bonus. Wear the proper safety gear — ’nuff said. Though in all honesty, we’ll do a post over that later as well. The last area to be aware of is attitude. I’ve witnessed three major states of mind when people pick up a chainsaw; moronic disregard for one’s own safety/not respecting the tool, unholy fear that it will somehow turn into a snake and strike, and of course educated operation. The latter is to be preferred. Chainsaws are just tools like anything else — extremely powerful tools, but still tools. They should not be feared or given wide berth because of some bit of gory lore that somehow, through the same evil sorcery that brought Christine to life, chainsaws injure all those around them: They don’t. Nor should they be treated as toys — they’re not. Almost all chainsaw-related injuries can be tracked back to the ignorance/inattention of the operator or poor saw maintenance. So don’t do that. In the end, objects themselves are not dangerous until we start interacting with them. Our own skill and knowledge is what turns a stick into a lever or rock into a counterweight. 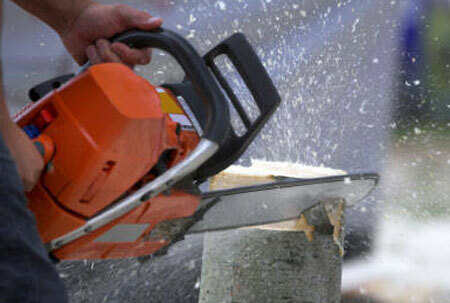 A chainsaw is a force-multiplier created to give one person the strength and speed of many. The tradeoff for all that power is the danger that it can be turned on its master. Learning how and why that turnaround happens grants us the ability to harness its strength and greatly reduces the likelihood of injury. Next up, we will be running down the saw itself and how to set it up. Wow. If you’re looking for best practices, please ignore image 4. That individual’s hand placement renders the chain brake useless. I don’t know about on older saws, but on a modern saw like this one your hand placement has nothing to do with the functioning of the chain brake. They are called inertia brakes because the inertia of hand guard itself is enough to activate it. The hand guard is free to rotate, so as the saw kicks back, inertia keeps the hand guard stationary. 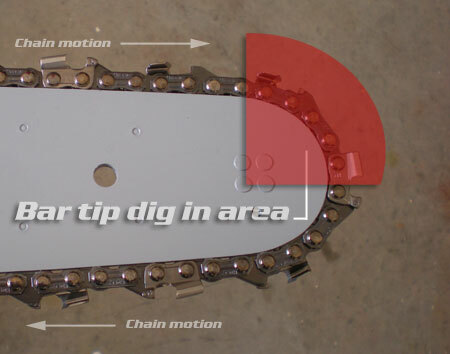 The rotating action of the saw back against the hand guard engages the chain brake, same as if you had pushed forward on the hand guard. Sorry, I shouldn’t say hand placement has nothing to do with the brake. The left hand slipping off the grip and hitting the guard will also activate the brake. But in forceful kickback situations, inertia alone should do it. As a long-time British Columbia, west coast logger, and user of chainsaws of various brands and sizes, the saw will often have to be tilted on its side (e.g. when making falling cuts, notching stumps, etc.). There is no ergonomic way to hold the bar behind the chain brake when the saw is on its side and that is why most falling saws will have a wrap-around handlebar installed. I’ve used an older saw without any safety or comfort features, and I’ve used a modern one – same power, same capacity. The new one is a heavy dog that is fatiguing to use. It is awkward to position, and you feel less in control of it – compared to the older one. The older one is sleeker and lighter. It feels more like an extension of the arms. It is easier to use for long periods, and is easy to keep under control. If you maintain good position, keep aware of the saw, your position in relation to it, and potential hazards, I think it is safer than the modern one with all the extras. Yup, kickbacks can happen – but it’s sort of like hitting a pothole – not a big deal unless you are half asleep at the wheel. My 3 HP router with a 3″ bit in it scares me more than my chainsaw. So here is a basic question: how does one sharpen a chainsaw blade? I think mine is dull. For that matter – how does one know when one’s chainsaw blade is dull? The included link has some reasonable information and is from one of the larger chain and bar manufacturers. Chain sharpening is an art and something that requires a lot of practice. As to how you tell when it is dull: when cutting properly the saw should feed itself (this is as much a reflection of raker depth than tooth sharpness though) and should produce chips not sawdust. A dull chain will force you to put a lot of weight on the bar to cut and it makes the saw far more difficult to use. The leading edge of the chromed surface of the tooth should be clean and not malformed and the rakers set at the appropriate depth. @Ben, I’m not so sure about your comment. On the few occasions with my Stihl that I’ve experienced kickback, the weight of the handbrake was enough to engage the brake. I know this because I was using it as pictured above. By the way, when cutting downward you hand is positioned behind the brake assembley, and at the same time, your head is directly above and in line with the blade. When your notching or felling (cutting horizontally) your hand may not be behind the brake/guard, but no part of your body is directly in line or near where the blade would go in a kickback (the saw would have to rotate over 180 degrees to get your leg, as oppose to say 60 degrees to get your head when cutting vertically). I hope my garbled rant is legible. Chains dull fast. My father cut firewood to supplement his winter income. In a given morning he would spend almost as much time sharpening as he would cutting (every tank). A cheap thin round file struck a few times at the right angle on every tooth. Beyond that – HF sells a bench-top sharpener. It’s crap. There are guys in every neighborhood I’ve ever lived in that have better bench-top sharpeners. My dad had about 10 chains for his FarmBoss. Three or four were always sitting at the sharpeners. The round files are also nesc to keep the teeth on metal weed wacker baldes effective. Speaking of image number 4… No leather gloves? Apparently no chainsaw chaps? Aren’t those two very basic elements of “proper safety gear”? According to the Stihl rep who gave a safety demo I attended, something like 80% of all chainsaw accidents could be prevented (or vastly reduced in severity) by wearing leather gloves and chainsaw chaps. Kickback is always a potential. If a user is alert and thinking about where that bar tip is positioned, what if anything is close to it (The bar tip danger zone) and where the bar will swing in a bad kickback the hazard can be minimised. Ask a professional cutter: What is the minimum PPE or safety gear they are required to use? Why would ANYONE use less? 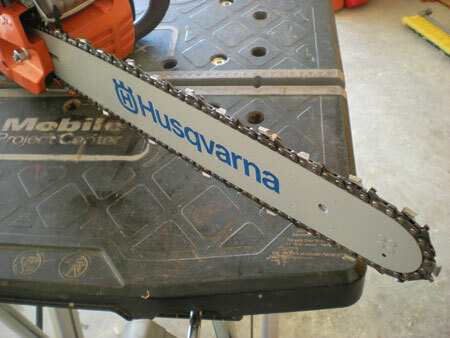 Here in New Zealand we can import chainsaws, but when in use they must have a leather hand grip laced to the font bar. This almost locks the left hand in place on that bar for added control. It also helps maintain the complete grip for hand on the front bar with the thumb wrapped under the handle (again for additional control). I’m not an expert but I do use a big saw, and although I have spent many hours cutting hundreds of cord of wood for home and on the farm, I was very much appreciative of the professional training course I attended. It enlightened me to the Safety, use, care and maintenance of a chainsaw. I wondered what there was that I could gain from such a course? I now save on costs (chain sharpening), a sharp chain in good condition cuts well and efficiently without extra work! and I feel very much safer! I still have all body parts intact!